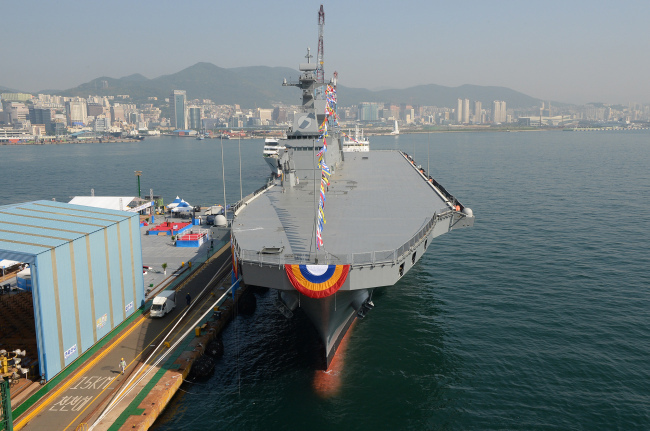 BUSAN -- South Korea’s military on Monday celebrated the launch of its second amphibious assault vessel, pledging to ratchet up efforts to defend against maritime challenges in surrounding waters. Named after South Korea’s southernmost island, the 14,500-ton Marado vessel made its first public debut at the shipyard of Hanjin Heavy Industries & Construction, a shipbuilder located in Yeongdo, Busan. Defense Minister Song Young-moo hosted the launch ceremony, which was attended by top military brass, including Chief of Naval Operation Adm. Um Hyun-seong and Lt. Gen. Jun Jin-goo, commander of the Marine Corps. Originally designed for amphibious operations during wartime, the vessel will assume other peacetime missions, such as carrying troops and equipment for disaster relief and rescue operations, according to the country’s arms procurement agency, the Defense Acquisition Program Administration. The Navy said the ship’s name epitomizes its commitment to defending waters south of the Korean Peninsula and maritime transportation routes. The Marado is scheduled to be delivered to the Navy in late 2020, becoming the second transport ship after the Dokdo of the same class, according to the Navy and DAPA. “The Marado is basically similar to the Dokdo, but equipped with improved equipment and an improved system,” a DAPA official told The Korea Herald, requesting anonymity, citing official rules. The Marado will be equipped with a more advanced radar and combat system developed by South Korea, such as an anti-aircraft radar system and anti-ship missile defense, according to the Navy and DAPA. The Marado vessel is capable of carrying up to 1,000 troops, armored vehicles, tanks and other heavy military equipment. It can also mount high-speed amphibious boats and helicopters. Promulgated as LPH-6112, the Marado is 199 meters long and 31 meters wide and can travel at a maximum speed of 23 knots (about 41 kilometers per hour) with a crew of some 300 aboard, the military added.